Beer, it’s a funny old thing, just when you think you know your stuff, up turns something completely different to blow your mind and set you off on another mad journey of discovery.. Thinking back about 18 months when I really seriously got into beer and not just accepting any old slops cheaply named with an “ooh err Mrs” style pump clip. Designed to attract me because it’s name had some extremely loose connection with ladies bits, or perhaps sticking one up a goblin etc etc (see Pumpclip Parade for details), anyway way back then I remember trying my first real sour beer, it was Hanssens Artisanaal Oude Geuze.. If you are not familiar with Lambics, Geuze, (Geueze) whatever, that name will mean nothing, but let me tell you I thought it was foul, absolutely undrinkable and most of it ended up in the sink. My thoughts were at the time, “if I had some fish and chips, this would make a perfect condiment, that is if it didn’t melt the food before my very eyes..). So when I was invited to a bottle night at The Wharf in Macclesfield last week, theme “sours” and the first picture I saw contained a bottle of Hanssens, you can imagine I approached the evening with a bit of trepidation. 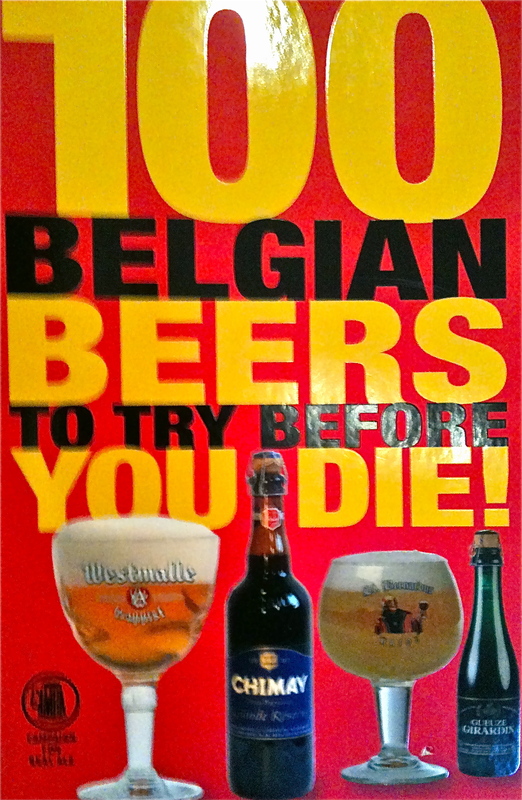 However it’s worth saying that since then my horizons have been broadened and I’ve dabbled in the odd Lambic etc with higher degrees of success after several visits to Belgium, exploring the delights of La Mort Subite and Meoder Lambic to name but a few. La Mort Subite is where I started actually liking some of these beers, they had a nice range, both plain and fruit flavoured which were not quite as sharp as examples I’d tried before and even the wife liked them which makes life easier all round. Fast forward a year or so and I’m at Moeder Lambic and trying Tilquin for the first time, far more serious and actually enjoying it, so that’s what I took along as I knew I’d at least like one and that’s where we kicked of the night. No surprises here as it’s now a firm favourite, light, fresh and refreshing I’m actually getting to like this stuff (what’s wrong with me??). Then, my arch nemesis, Hanssens Artisanaal Oude Geuze…first sips, I still have a tongue, a little more and wait, a gaping hole has not appeared where my oesophagus should be, this stuff is not so bad after all. It’s stronger flavoured yes, but not harsh it’s rather smooth, I’m shocked! We then went coincidentally to Mort Subite, strange because I wasn’t picking the order but it sort of followed an almost freaky pattern and this is where it all went a bit weird for me. After the two previous drinks this, an old favourite, my entry-level beer was pretty damned awful and the sentiment echoed around the table. It’s sooo sweet which is probably why it’s far more palatable to the novice, but far more than I ever remembered tasting rather like Appletise, another complete shocker. Then things started to get serious, out came the big guns Cantillon..
Now I’d had some Cantillon beers over the last year or so, but on previous occasions not got on too well, so again I was wary here. But fear not, at last I’m starting to see what this is all about and the Fou’ Foune was just divine, sour but not lip pursing, it’s a full flavoured apricot fest in a glass and in my top three beers of the night. Cantillon Grand Cru Broucsella – a pure three-year old lambic which again was delicious. Not a firm favourite from everyone because of the lack of carbonation but definitely one to seek out and savour. 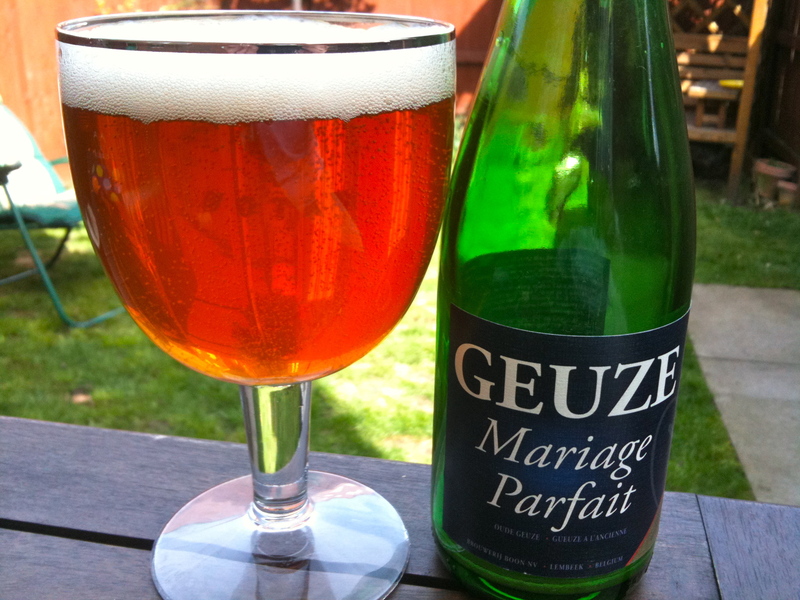 Boon Marriage Parfait – One of my personal favourites this and one that I’d recommend to anyone wanting to try Geuze for the first time, I always try to keep a few of these knocking around and they are reasonably priced too. Better than champagne any day of the week. Gueuze 100% Organic Lambic – Not a stand out favourite in this company but still really very good. Rosé de Gambrinus – Probably the sour/bitterest of the lot and surprisingly one of my favourites, think juicy but under ripe raspberries, there’s so much fruit in here it’s incredible. Cantillon Lou Pepe Kriek – Wow, the best well and truly until last, intense cherry fruit flavours, an absolute class act, I want more..
As you can see we had a really good range of top quality beers sitting empty on the table as we’d finished, a few that are probably having lambic lovers salivating right now and I am truly shocked at what I discovered about my own tastes and how they have developed over the last couple of years. If you’d asked me in 2010 to try some of these, I may have done so (be rude not too) but I doubt very much if I’d have really enjoyed it and no way could I see myself writing this now. 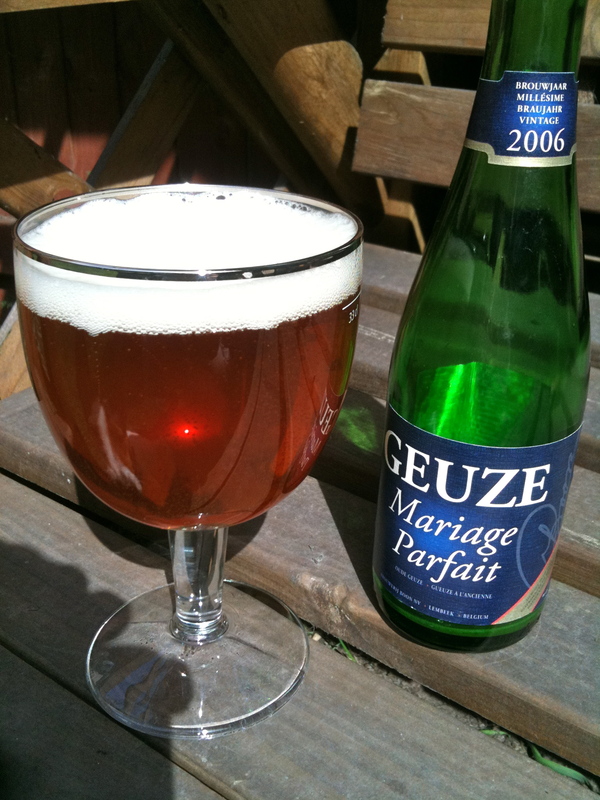 I was discussing the merits of Gueze, Gueuze and Lambic beers the other day as being a perfect summer drink, as we are having a very rare sunny weekend, my garden chores were done so I decided to test the theory with Brouwerij Boon’s Mariage Parfait (Perfect Marriage). Not being a massive fan of this type of beer I was interested to see what the flagship top of the range product for Boon would be like, after all the Boon Oude Kriek was very good, reviews were great too, all the signs were promising.. Sealed in the typical Boon champagne cork style it cracked open with a reassuring fresh pop, releasing a misty mix of aromas of apples, cider even, lemons. It pours with a quite dense white head which lasted in some form to the last, the beer being a light amber in colour, with an ever so faint haze from the bottle conditioned sediment. Taste, unsweetened stewed apples, raisins, lemon citrus and maybe a little bitter grapefruit, it’s good, VERY GOOD. There’s an aftertaste I can’t quite put my finger on, it’s tart, malted but very more-ish. So to the theory, is it a great summer sunshine drink? Definitely, without doubt the nicest beer of this style I have ever had the pleasure of tasting, the sunshine only adds to the experience, a perfect marriage. All of the Boon Geuze produced is of the type “Old Beggar”, ie those in the traditional way Gueuze brewed and meets the stringent EC standards apply to the protected name. The system for which the lambic is aged and blended Geuze Boon is still the same as the one by Jean De Vits (1874-1952) and René De Vits (1909-1993) was put on point. When Frank Boon in 1977 geuzestekerij R. De Vits over, there were still major differences in quality between different bottlings. For the past mistakes to avoid frequent production, significant investments. Iron mixing tanks were replaced with stainless steel tanks, mixing vessels are kept at constant temperature, etc.. Cleaning and bottling done automatically. The secondary fermentation in the bottle is at constant temperature (formerly the lower layers in the Caveau bottles in the cold at the floor and the upper layers in summer is often too hot). The mixture of Geuze Boon made from 100% to Lembeek brewed beer. 90% of the mixture consists of tender Lambic at least two seasons (= about 18 months old), about 5% of beer character of 3 years and 5% of very young Lambic, which provides fermentable sugars and viable yeasts. Pour into a mixing vessel of 25,000 lit mixed, chilled, clarified and then cold stored. The bottles are either in boxes or in baskets of 600 bottles. At bottling, the Lambiek back to fermentation temperature and in a climate chamber for secondary fermentation in the bottle. After fermentation followed by a ripening at low temperature. I have to confess to being a little wary about trying this beer, lambic beers are certainly an acquired taste and the last Cantillon beer I had tasted, the Lou Pepe, was perhaps a little too much too early for the uninitiated. It was lip pursingly acidic and at the time tasted more like something I’d put on fish and chips.. Nevertheless I have persevered and am gradually finding them more and more enjoyable. The Iris though is worlds apart from the last one being far more like a traditional hoppy bitter beer than it’s stablemate, don’t get me wrong the lambic vinous taste is still there, but in much more of a balanced way making this far easier to drink. 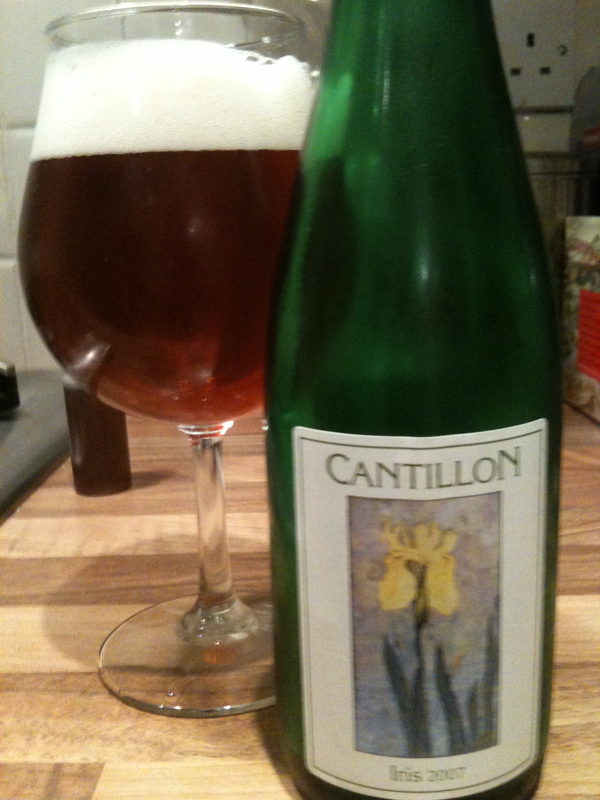 Unlike other beers from Cantillon the Iris is not brewed with wheat but is only made with pale ale malt, giving it is amber colour on the pour accompanied by a fluffy head which disperses quickly. There is a really fruity full bodied and slightly malted flavour to the beer, the acid is there, but is much less pronounced, finally you get that hop finish which is delicious. Cantillon Iris is also different because of the “cold hopping” technique used in the latter stages. After two years in the barrel, the Iris undergoes a second fresh hopping two weeks before the bottling. A linen bag, filled with hops, is soaked in the beer for two weeks. This gives the beer a more intense savour and makes the smell and the taste more bitter. All in all a very different experience and one that has given me more confidence to try more lambic, if you fancy trying one I’d recommend going for something like a Mort Subite Gueuze or Oude Gueuze first, but I’d definitely look out for this as it is excellent. This beer was sourced from BeerRitz, who have a highly respected speciality beer shop in Leeds as well as a mail order service. 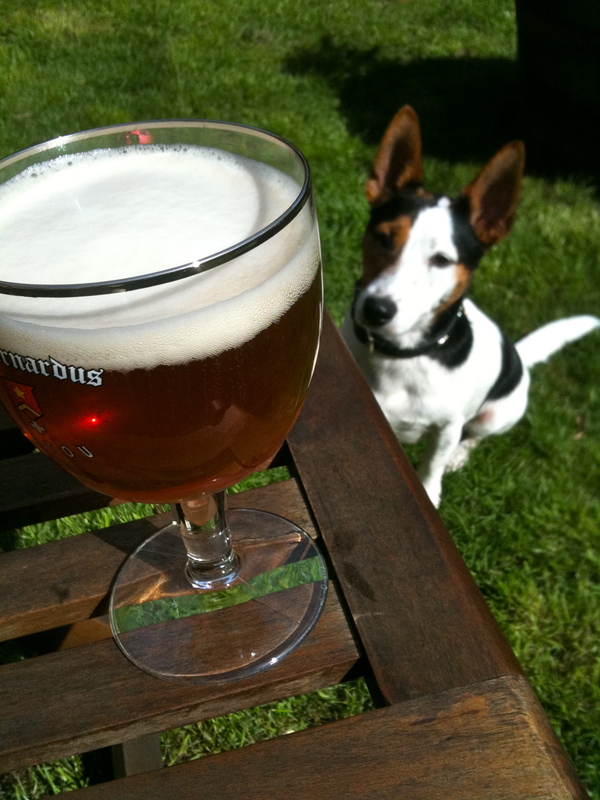 You can follow Cantillon on Facebook here.